After polling the Audiofanzine community for their favorite DAWs and electric guitars, the time has come to find which are their favorite basses. Who will share the throne with Ableton Live and the Fender Stratocaster among the big winners of this year? 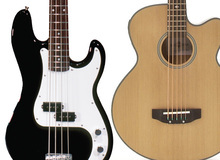 LTD has introduced the B-1004SE Multi-scale bass as well as its 5-string version, the B-1005SE. At the Musikmesse, Hotone present a large collection of guitar pedals and mini amp heads. Blackstar Amplification has unveiled the Fly 3 Bass, a bass version of its 3-watt mini-amp range. Live demonstrations of Electro-Harmonix's Soul Pog, Lester G, Lester K, Bass Preacher and Super Space Drum pedals at the 2016 NAMM. A demonstration of Catalinbread's new SFT, Bicycle Delay and Discman pedals, live from the NAMM. TC Electronic present their new Ditto X4 looper, BonaFide buffer and SpectraComp Bass Compressor pedals. Peavey has reintroduced their Cirrus 4 bass guitar model at the 2016 NAMM. Aguilar Amplification presents the SL 410x bass cabinet, announced as a super lightweight bass cabinets "with no compromise in tone".